Tornado’s Straight Lake outpost lets anglers get away from it all and enjoy some great fishing. Just a minute away, across a 100-m portage, Courtney Lake offers smallmouth & largemouth bass, as well as good northern pike fishing. 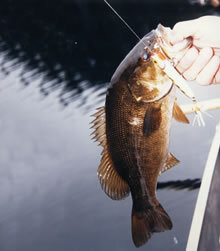 Straight Lake smallmouth bass are abundant, can reach trophy proportions and, like the bass throughout this area, can be caught consistently on jigs, in-line spinners, plastic worms & lizards, small crankbaits, and topwater plugs. On Courtney Lake, add a spinnerbait to your tackle pack for both the largemouth bass and northern pike that you are sure to encounter.